IDF Chief of Personnel Branch Major-General Avi Zamir is not willing to permit recent events to pass without a response, boldly calling on the hesder organization’s roshei yeshiva to denounce recent acts of insubordination by Shimshon and Nachshon Battalion soldiers as reported by YWN-Israel. The senior military commander gave them a one-week deadline to comply, signaling their failure to do so would result in consequences regarding the future relationship between the IDF and hesder institutions. According to a Ynet report, the senior commander met with hesder representatives on Tuesday, following up with a letter on Wednesday, at which time he gave them an ultimatum. Zamir warned that if they do not openly disassociate themselves with such acts of insubordination, the military will cut the existing arrangement with hesder yeshivot. The letter according to the report was extremely “blunt” and it did not lend itself to being “misunderstood”. The yeshivot which appear to be at the head of the IDF list are those of Rabbi Elyakim Levanon, in Karnei Shomron, and Rabbi Eliezer Melamed, in Har Bracha. Both roshei yeshiva are known for their outspoken adherence to the principle of Eretz Yisrael HaSheleima, a Greater Israel, opposing land compromise deals. 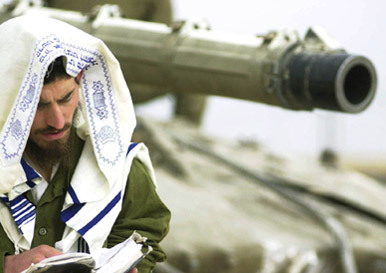 Zamir appears determined to extract a statement from hesder rabbonim, demanding they distance themselves from acts of insubordination to send a clear message to hesder-affiliated soldiers. Failure to comply will lead to Zamir following the actions of his predecessor Major-General (reserves) Elazar Stern, and begin action to dismantle the hesder program. The Hesder soldiers (and the religious zionist movement) want to be good zionists and good Jews. For almost a century, they have been in denial of the fact that the very idea of zionism is to replace Torah and Mitsvos with secular nationalism. Problem is that the IDF knows that the Hesder boys are the best soldiers they have…not an easy situation for sure. Yeah right. Sorry, but Rav Kalisher did not feel that way, and we religious zionists will take his reasoning over your opinions over yours any day.